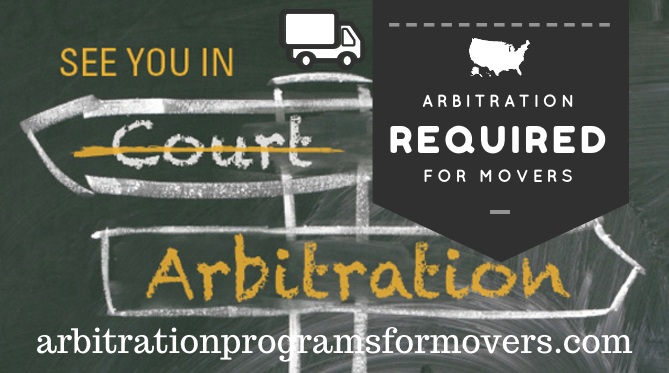 Where Is The Proof That An Arbitration Program Is Required For Movers? The USDOT has updated its software on its website. It is now your obligation to become a member of an arbitration program as a mover before you receive your temporary DOT number. If you are filling out your application, you will see that the form has been changed. Moving companies now must get four different products before having USDOT license awarded from the FMCSA. Please remember that receiving your USDOT number is a privilege. You should take pride and protect your license. The law is what it is. You must follow the rules and keep these four things above up to date. Not keeping these four things up to date and current will get your license revoked. Fines may occur as well if you operate without appropriate requirements. The FMCSA requires that you are part of an arbitration program before you are able to register as a moving company. This FMCSA Webpage shows proof arbitration is required for a carrier. It includes a list of what an arbitration program must include. It also includes rules that providers of arbitration must follow when arbitration is necessary. Between a company and shippers/customer. See the pdf attached to this webpage. If you need more information on processing the laws on arbitration feel free to call us at 702-333-2430. We will be able to answer any questions about arbitration disputes. We are trying to help moving companies stay legal in the moving industry. Being informative and helpful is our key to success. It is in our best interest to make sure that your moving company is able to succeed. So, we make sure to let you know what you need to succeed. If you are still not sure that arbitrator is necessary, give us a call and we will talk it through with you. If you also have other questions of laws and regulations within the moving industry, we can help. Our associates will be ready to answer your call and offer advice at 702-333-2430. Why Choose HHG Arbitration Program? We are knowledgeable on all aspects of the moving industry. Our experience consists of many events and situations in over ten years in moving. We only provide the most recent and most accurate information on arbitrator decision. We stay up to date on documents relating to the moving industry. Many movers who enter the industry are not informed on what is required to give its consumers and rules are set by the government on moving. We take great pride in helping movers be informed on the latest information in the moving industry. Our mission is to make sure all moving companies who work with us are not left behind when it comes to claims and legal regulations. If you are a moving company that needs help from us, we make sure to inform you of everything you need. Get these things to stay successful. We believe that all moving companies should be on a fair playing field. So we make sure all moving companies that we know of are following the rules when it comes to laws and regulations in the moving industry. If you want more proof arbitration is one of the requirements for movers, please give us a call.